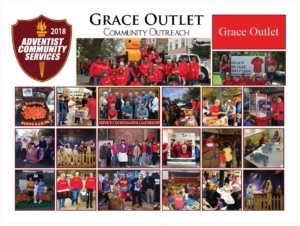 2018 — Grace Outlet Seventh-day Adventist Church, Reading, Pa.
Grace Outlet’s commitment to their community is evidenced through their ongoing events to the community which include: feeding the homeless at Opportunity House Shelter, providing games/activities for an afternoon at Olivet Boys’ and Girls’ Club, participating in the Reading Christmas parade, sharing sack lunches and much more with those in need downtown each Sabbath afternoon, building relationships with teens through ongoing commitment to the Children’s Home of Reading, providing meals and lap blankets for patients and their caregivers at Hope Lodge in Hershey, Trunk or Treat, and monthly relationship building events/crafts for women. 2017 — Allentown Seventh-day Adventist Church, Allentown, Pa. 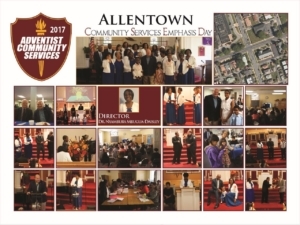 The Allentown church’s Community Emphasis Day won the ACS Award for 2017. Pastor Carlyle WildmanPastor, Event Coordinator Dr. Nyambura Mbugua Daisley, and Guest Speaker Pastor Clyde Thomas, retired President SDA Tobago Mission, hosted the day which featured first responder representatives from the Allentown Police, Fire, Emergency Medical Services (EMS) Departments, Officer William Rodriguez (husband of lsmari), Simplicity representative, Dr. Jeffrey McAuliffe, Jeannette Dare, director of Community Services for the Pennsylvania Conference of Seventh-day Adventists and Allentown Mayor Ed Pawlowski. 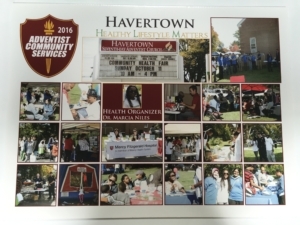 2016 — Havertown Seventh-day Adventist Church, Havertown, Pa. Coordinator Dr. Marcia Niles obtained permission from the police department to close off the entire block around their church, then with the help of many volunteers, utilized the entire church property for a health emphasis weekend. Flyers were sent to 5,000 addresses in three zip codes. The event included keynote speaker, two radio stations (one reaching the Caribbean population), psychiatrists, oncologist, many area hospitals, nurses, health screenings, police and fire department education for children, refreshments, children’s entertainment, and giveaways. 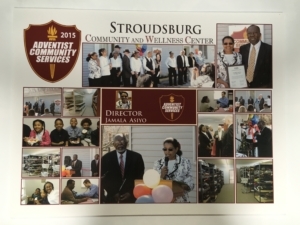 2015 — Stroudsburg Seventh-day Adventist Church, Stroudsburg, Pa.
Making door-to-door contacts and nearing 1,000 clients served yearly, director Jamala Asiyo reports a working relationship with several community agencies. The center provides bedding, clothing, food, furniture, coats, and toys. Volunteers run programs for families of prisoners, health screenings, a homeless shelter, and soup kitchen. 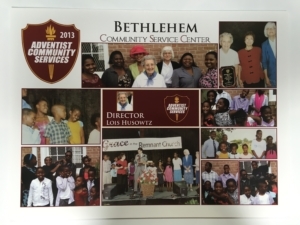 2014 — Pittsburgh Seventh-day Adventist Church, Pittsburgh, Pa.
2013 — Bethlehem Seventh-day Adventist Church, Bethlehem, Pa. Under the leadership of director Lois Husowitz, Bethlehem became a true outreach in the real sense of the word. Instead of clients coming to them, the church goes to those in need. Building a relationship with the city’s New Bethany Ministries, volunteers collected canned goods and cooked for the ministry with Panera Bread donating baked goods to their cause. “Kenya’s Singers,” a group of children and parents, sing once a month for several nursing homes. The ministry continues under the direction of Vilma Tambong. 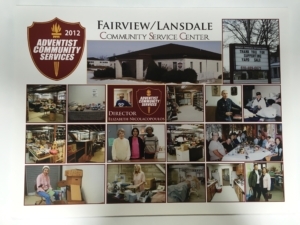 Under the direction of former director Ruth Ann Christ and current director Elizabeth Nicolacopoulos, Fairview and Lansdale members have served their communities for more than twenty years. The center contains a food pantry, kitchen, classroom, docking depot, furniture basement, and clothing room. Center volunteers work with other organizations in the area and help approximately thirty families each week. 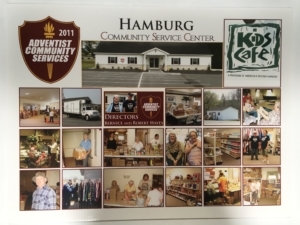 2011 — Hamburg Seventh-day Adventist Church, Hamburg, Pa.
For three decades volunteers led by Bob and Bea Hayes spend two mornings a week sorting and disseminating clothing and household items dropped off 24 hours a day, seven days a week. While working with several community agencies, the center dispenses bedding, furniture, runs a food pantry once a month, and provides counseling, serving more than 8,000 clients annually. 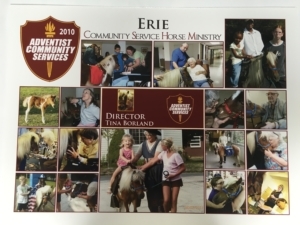 2010 — Erie Seventh-day Adventist Church, Erie, Pa.
Director Tina Borland has led Erie members in an innovative ministry involving therapeutic miniature horses. Cimmaron, which she has trained, and Miracle regularly visit nursing homes and retirement communities–wearing special shoes provided to protect their feet. Requests for the horses have come from as far away as the east coast for presentations, parades and children’s birthday parties.